Drug pushers play a prominent role in the United States’ medical system. They are highly esteemed for the meals and gifts they offer to physicians and the subsidies they provide to medical associations in the form of educational grants and journal advertizing. When I first entered medicine there was usually only one representative of a company in each territory. He (it was usually a “he” in those early days) was responsible for promoting sales of all of the drugs produced by the company. Over time corporations began to employ a different salesperson for each division of products. The day ultimately arrived when each drug had multiple agents promoting it. While I was engaged in the standard practice of medicine I found it necessary to strictly limit the number of agents I was willing to see on a daily basis. Had I not placed limits on the frequency of each salesperson’s visits I would not have had time available to see patients. Ultimately, I chose not to receive any pharmaceutical representatives. That meant, of course, that I no longer could provide “samples” to my patients. I had learned, however, that providing samples was a trap. The only drugs available in the sample cabinet were those that were still on patent. Equally effective drugs were almost always available for a fraction of the cost of the sampled products. When I stopped accepting and distributing drug samples my average cost per perscription, a figure that was provided to me in reports from insurance companies, dropped dramatically. During the encounters I had with drug pushers they predictably extolled the virtues of the product that was being promoted. Potential adverse effects were rarely mentioned, leaving the impression that they were not worth considering. There were even times when I was told that the drug that was being introduced provided incredible benefits and produced no undesirable effects. It would have been more correct to state that it produced no known adverse effects. With the exception of bioidentical hormones, which are prescribed when the body fails to produce adequate amounts of the hormone on its own, drugs are chemicals that block the body’s ability to do what it is designed to do. Since they interfere with mechanisms the body uses to survive, all drugs carry a risk of producing undesirable effects. In many cases a drug will produce an effect that is beneficial in one respect, but detrimental in others. The ubiquitous aspirin is an excellent example. Platelets are blood components involved in the clotting process. Taking a baby aspirin a day will block the ability of platelets to stick together. This will decrease the risk of a clot causing a heart attack. Unfortunately, the inability of platelets to stick together will prevent them from stopping blood vessels from leaking. People who take a baby aspirin a day have a significantly higher risk of having a hemorrhagic stroke, which is the result of bleeding into the brain. Beta blockers are drugs that block the action of a part of the autonomic nervous system, the system that maintains stability in the body systems that are not under conscious control. One of the actions of beta blockers is to cause arteries to relax, which can have the beneficial effect of lowering blood pressure. They have the opposite effect in the lungs, however, where they cause bronchial tubes to tighten. Taking a beta blocker can simultaneously cause a desirable drop in blood pressure and trigger an asthma attack. The most insidious drugs are those that produce results that appear beneficial in the short term while creating serious consequences in the long term. As I reported in April, the medical system in the United States is focused on the short-term result. This places unsuspecting patients at high risk of experiencing serious consequences as the result of taking drugs that have been approved for use on the basis of short-term studies. Some of the most malevolent drugs in this regard are the members of a family called bisphosphonates. Commonly prescribed bisphosphonates include etidronate (Didronel), pamidronate (Aredia), alendronate (Fosamax), risedronate (Actonel), zoledronate (Zometa or Reclast), ibandronate (Boniva), and tiludronate (Skelid). The class was initially introduced to treat Paget’s disease of the bone, a condition characterized by excessive bone breakdown and reformation. The vast majority of prescriptions today, however, are written for individuals who have been found to have osteopenia (low bone density) or osteoporosis (bone density low enough to increase the risk of fracture). The drugs were lauded for their ability to increase bone density. Few side effects were reported. The most notable was a tendency for the drugs to cause ulcers in the esophagus. Potential users were assured that this could be avoided by taking the drug at a time when they would not need to lie down for 30 minutes. More serious effects began to appear after three to five years of use. These could have been anticipated had the mechanism by which the drugs increase bone density been carefully considered. Under normal circumstances bone is constantly being broken down and rebuilt. This is because bone becomes more brittle with age. Specialized cells called osteoclasts are constantly dissolving old, brittle bone and cells called osteoblasts are constantly laying down new, supple bone. Osteopenia and osteoporosis develop when the removal of old bone exceeds the rate of new bone formation. Bisphosphonates work by blocking the body’s ability to remodel bone. As is shown in figure 1, osteoclasts stop grinding up old bone almost immediately. Osteoblasts continue to build bone for six to twelve months before ceasing to function. 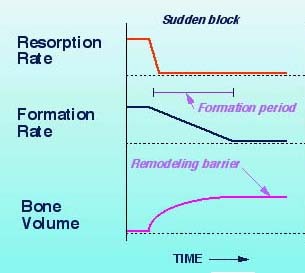 Bone volume increases during the six to twelve month period that osteoblasts are continuing to lay down new bone while old bone is no longer being removed. At that point bone volume plateaus and remains fixed. Minerals may continue to be deposited resulting in greater bone density, but as the bone ages it becomes increasingly brittle. Figure 2 compares the rate of normal bone formation (placebo) to that of various doses of Fosamax after two years. As can be seen, almost no bone is being renewed following the administration of the drug. Two undesirable outcomes from the use of bisphosphonates have emerged. The first to be reported was osteonecrosis of the jaw, a condition commonly referred to as a dead jaw. Dead jaw begin to appear after two or three years of bisphosphonate use. Approximately two-thirds of dead jaw cases follow dental surgery or trauma, but a third occur spontaneously. Death of the bone is often accompanied by severe pain in the jaw or gum area. Other effects include the appearance of loose teeth, dramatic gum loss, and the presence of exposed bone along the gum line. Admittedly, osteonecrosis of the jaw is a rare occurrence, currently being reported in one in 10,000 individuals taking a bisphosphonate drug. The challenge is that statistics become meaningless when applied to individuals. Knowing that he or she is the 1 in 10,000 who developed the condition is of no comfort to the person whose jaw is rotting away and for whom no corrective treatment is available. Dead jaw began to appear between two and three years after individuals had first taken a bisphosphonate. Equally serious challenges were soon to follow. Over the past year a previously rare form of fracture has been reported in increasing numbers. These breaks, two of which are shown in figure 3, occur in the mid-femur (thigh bone). Unlike osteoporotic hip fractures, which typically occur as the result of a fall, the mid-femur fractures occur with little or no trauma. Panel A shows a fracture of the femoral shaft in an 83-year-old woman with a 9-year history of alendronate use. Panel B shows a similar fracture in a 77-year-old woman with a 5-year history of alendronate use. The non-traumatic thigh bone fractures begin to appear five years after an individual has started bisphosphonate therapy. They appear to be a direct result of the aging of the bone that occurs when remodeling has ceased. The bisphosphonates have caused bone density to increase over time, but they have also caused the bone to become increasingly more brittle. Finally the day arrives when the bone can no longer support the weight of the body. It simply snaps as a result of the individual taking a step. The risks of dead jaw and mid-thigh fractures are particularly alarming because once they are in the body the drugs will continue to stop bone remodeling for decades, perhaps for the rest of the user’s lifetime. This is because the half-life, the length of time required for half of the drug to be removed from the body, is ten years. This is why some bisphosphonates are being administered intravenously on a once-a-year basis. Half of the total amount of the drug will still be in the body ten years after treatment is stopped. It will take another ten years for half of that amount to be removed; one-fourth of the total amount of drug administered will still be in the body twenty years after the drug has last been taken. Other adverse effects from the use of the bisphosphonates have been reported. In 2005 and again in 2008 the FDA warned that the drugs cause severe bone, joint, and muscle pain in some individuals. This side effect may be more common than recognized, because physicians and patients often attribute the pain to the presence of osteoporosis. The pain has appeared as soon as 14 days after the first dose, but can appear at any time during treatment. People have described the pain as “severe”, “disabling”, “extreme”, and “incapacitating.” Many become unable to walk or perform their usual activities. Some require the use of walkers or wheelchairs and others become bedridden. The pain typically eases slowly when the drugs are discontinued and returns if they are restarted. Just as in the case of osteonecrosis of the jaw and mid-tibia fractures, pre-marketing studies did not reveal the danger. Only after the drugs were in widespread use did the risk become apparent. The drugs can affect the nervous system resulting in amnesia, confusion, depressions, and hallucinations. People can see things that are not present or they may sense smells or hear sounds that are not present. The nervous system effects are sometimes dose related, occurring when an individual takes a larger amount once a week, rather than a smaller daily dose. Inflammation of the eyes can occur. This resolves over several days to several weeks with discontinuation of the drug, but it can be severe enough to require hospitalization. The inflammation is believed to be triggered by the drugs tendency to increase the production of inflammatory compounds within the body. This inflammatory action is believed to be responsible for the flu-like syndrome some individuals experience. Fever with accompanying muscle, joint, and body aches can occur. Kidney failure has been reported with use of bisphosphonates, and in some instances this complication has been fatal. Kidney failure is seen almost exclusively with the intravenous administration of the drugs. For this reason, anyone considering use of the drugs needs to weigh the advantage of avoiding the dangers and inconvenience of oral medications such as ulcers of the esophagus with the risk of kidney failure with IV use. Given the risks of serious or life-threatening consequences associated with of bisphophonate drugs one must ask why they have become so widely prescribed and used. The argument is one that is common in medical practice in the United States: The risk of experiencing a serious consequence from taking the drugs is said to be less than the risk of having an osteoporotic fracture if they are not taken. Prescribing or taking the drugs is therefore considered the lesser of two evils. What is not stated is that the risk reduction in the studies was accomplished by comparing a group of people who received the drug with a group of people who did nothing to improve their bone density. Had the drugs been compared to the results achieved by individuals who began a comprehensive program to support their body’s ability to improve bone volume and bone strength the results would have been much different. Had that been done the people who chose to take the drugs may have fared worse rather than better than the comparison group. The fact is that bone volume and bone density can be improved and the risk of fracture reduced significantly by measures that do not stop bone remodeling or cause any adverse events. That being the case no responsible individual should be willing to prescribe or take the drugs. I have not done a formal study, but individuals with osteopenia or osteoporosis who choose to support their bodies’ bone-building ability routinely report an improvement in their bone density over time that equals or exceeds that reported with use of bisphosphonate drugs. The key is providing comprehensive support for the bone-building mechanisms. Osteopenia and osteoporosis are not simple calcium deficiencies. They are not straightforward mineral deficiencies. Individuals on bisphosphonates commonly increase the amount of mineral in their bones, but the bones become more brittle. The matrix, which is the framework of the bone, must be rebuilt and the process of bone remodeling must be supported. I ask individuals with osteopenia or osteoporosis to begin by taking steps to reduce the amount of acid in the body. The body is designed to be slightly alkaline (non-acidic) and this condition is ultimately maintained by using minerals to neutralize excess acid. Bones are the body’s mineral reserve and if they are drawn upon too frequently to address excess body acidity osteoporosis will develop. An alkaline state is accomplished by avoiding carbonated beverages and shifting to a diet that is rich in vegetables and fruits and low in animal products. I advise them to take a comprehensive supplement such as Lifetime that provides optimum levels of all vitamins, minerals, and essential amino acids. While most people are aware of the need for calcium in preventing and reversing bone loss and some recognize the need for other major minerals such as magnesium and phosphorus, few appreciate the role of trace minerals in the process. Trace mineral deficiencies are an independent risk factor for the development of osteoporosis. Lifetime provides all known trace minerals. I also recommend that a green plant supplement such as barley grass or wheat grass be included in the program. This is primarily because green plant nutrients support the matrix of the bone. An added benefit is the ability of green plants to further reduce the acidity of the body. Because of the importance of major minerals I urge people to provide additional calcium, magnesium, and phosphorus. Calcium cannot be optimally utilized without magnesium, and studies have shown that individuals who do not include phosphorus when supplementing calcium will become phosphorus deficient. This is because the two minerals compete with each other for absorption. Vitamin D is critically important in maintaining bone integrity as is the trace mineral boron, which the body needs to covert vitamin D to its most active form. While calcium, magnesium, phosphorus, vitamin D and boron can be obtained individually they are available in a single preparation called Liquid Calcium and Magnesium. I believe that it is wiser to support osteoblasts, the cells that lay down new bone, than to block the action of bone remodeling cells. This can be accomplished by providing bioidentical progesterone. This is most commonly done through the use of creams, which allow the hormone to be absorbed through the skin and distributed throughout the body before it is broken down in the liver. If progesterone is taken orally, it passes through the liver and is broken down before being sent throughout the rest of the body. Men as well as women can safely use progesterone. Men may prefer DHEA, which is used by the body to produce testosterone. In either case the osteoblasts are turbocharged allowing them to lay down new bone at a rate greater than that at which the osteoclasts are dissolving old bone. The result is greater bone volume and density over time. Osteopenia and osteoporosis can be corrected without the use of bisphosphonates. When a bisphosphonate drug is recommended it is important to consider the risks involved in doing so. It is also important to recognize that the decision is irrevocable, as the drug is likely to remain in the body for decades. The decision need not be one of choosing the lesser of two evils: an osteoporotic fracture on one hand or a dead jaw or mid-femur fracture on the other. One can successfully prevent and reverse bone loss without stopping bone remodeling and risking the catastrophic consequences of doing so.